Evian plans to introduce both a new online delivery system and new digital device to consumers in 2013. The website, evianchezvous.com, will enable consumers to customize their water shipments according to their preferred frequency, amount, and choice of water products offered by Danone. The company will offer free delivery of a 15-euro purchase and pick up empty bottles for recycling. The new Smart Drop device will feature a WiFi-enabled magnet with an LED screen that attaches to the refrigerator and allows for water delivery with the push of a button. Targeted to single-family homes and small businesses, both will debut in the Paris area and eventually expand into other global markets. 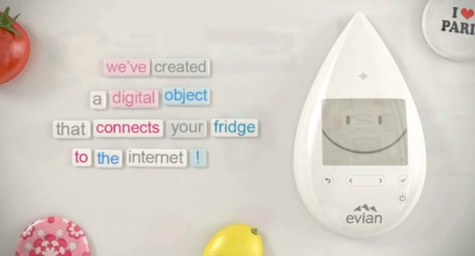 AdAge.com provided details about Evian’s evolution. The company’s shift toward e-commerce and direct consumer interaction are the result of the recent growth of the bottled water market, along with the desire to make it easy and convenient for consumers to replenish their water supplies. The devices themselves are designed to be user friendly and aesthetically pleasing with a simple push-button layout and clean white shell. In addition to calling for a major investment from parent company, Danone, Evian’s new online delivery system required a change in brand strategy since the company had previously positioned itself as an exclusive luxury product as opposed to a highly accessible consumer necessity. Still, Evian executives said the online marketing move was based on the company’s tradition of innovation, as well as their focus on meeting market needs. Considering that research revealed that one of consumers’ main problems was the heavy weight of bottled water, Evian’s online delivery system seems to be a natural evolution to help them outperform the wave of competitors and stay relevant to consumers of tomorrow. To learn more about the power of online marketing, contact MDG Advertising today at 561-338-7797 or visit mdgadvertising.com .